Daily Illuminator: Change Your Perspectives On GURPS! November 14, 2015: Change Your Perspectives On GURPS! From its beginnings nearly 30 years ago, GURPS changed people's perspectives on what was possible in an RPG. We continue that innovative spirit every month in the pages of Pyramid . 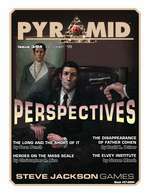 . . and this month's issue takes things even further, with Pyramid #3/84: Perspectives! This issue's supplement-length article from GURPS guru Sean Punch looks at the nature of time and space within a GURPS world. What special adjustments are required for long or short campaigns? What rule considerations are needed for a setting that takes place entirely in a tiny hamlet, or one that spans the entire multiverse? Fans of the best-selling How to Be a GURPS GM will love the ideas herein! In addition, this issue includes a guide for translating individual heroes into GURPS Mass Combat units. Zooming in and out from the field of battle has never been easier! There's also an adventure from David L. Pulver for GURPS Horror and GURPS Monster Hunters, where everything is not as it seems in the case of the disappearance of the "good" Father Cohen. And that's still not all! With Pyramid #3/84: Perspectives, your campaigns will push the boundaries of time and space, take your fights to new fields of battle, and uncover mysteries that could endanger the present or save the future. Download this issue individually, or subscribe to Pyramid today and shake up your perspectives on GURPS for months to come!